There are many rumors and stories about the links between vitamin deficiencies and weight gain, most of them unsubstantiated by medical knowledge and evidence. This article examines evidence of links between weight gain and vitamin deficiencies. Read on to find out more about how they are connected. Vitamin B12 deficiencies can lead to fatigue, dizziness, weakness, and even more severe symptoms. Often, people do not realize the connection between the lack of energy and the deficiency, less energy often leads to increased food intake and decreased exercise, inadvertently fueling weight gain. Fatigue and lethargy are two common side effects of a vitamin D deficiency. As a result, people are likely to be less active if they do not have enough vitamin D. Unfortunately, it does not follow that increasing vitamin D levels can aid weight loss. A deficiency of iron, is a common cause of lethargy, weakness, and fatigue in many people, but it disproportionately affects women, especially during menopause. Iron is found in red meat and dark leafy green vegetables. Often, anemia sufferers are prescribed iron tablets; however, these have unpleasant side effects, so it is generally preferred to supplement the diet with naturally iron-rich foods. Gaining or regaining weight can be just as difficult as losing weight. Gain weight is a slow process that takes months and years rather than days and weeks. Don't waste your time or money on powders and products that claim to lose weight. See your doctor before starting any weight-loss program. Vitamin B12 deficiency definitely does not lead to weight gain. One of the major symptoms associated with Vitamin B12 deficiency is weight loss, but there is some evidence for the argument that obesity can cause a vitamin D deficiency. As a study has shown, every time the body mass index of a person increased by 10%, there was a 4.2% decrease in the levels of vitamin D in their blood. About three-quarters of Americans are thought to be deficient in vitamin D, but only 34% are classed as obese, so while there is a link between the two, it is by no means absolute. 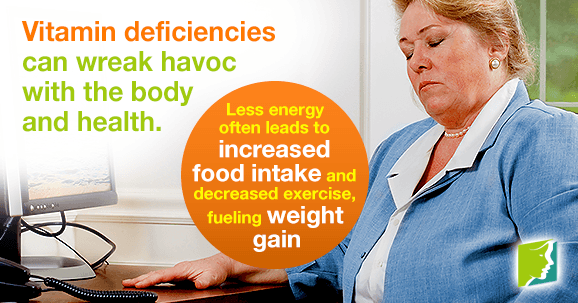 The link between iron deficiency and weight gain is related to the feelings of lethargy anemic women often display, as well as the low blood pressure, which means physical exertions can lead to dizziness. Consequently, they are less likely to exercise, and this can lead to weight gain or even obesity. While there are links between vitamin deficiencies and weight gain, in most cases weight gain is a result of a sedentary lifestyle. Maintaining a healthy, balanced diet with the recommended daily intakes of vitamins and minerals is imperative for the proper functioning of the body. Although taking vitamins alone will not help you lose weight, combined with regular exercise, it can promote weight loss and strengthen your immune system. You might want to check out these three treatments for weight loss.